Popular Hearthstone personality Octavian "Kripparrian" Morosan revealed the latest card coming in the game's upcoming expansion, The Boomsday Project. Omega Mind is a two-mana Shaman minion with two attack and three health. It also has a Battlecry ability that gives your spells Lifesteal this turn if you have 10 mana crystals. 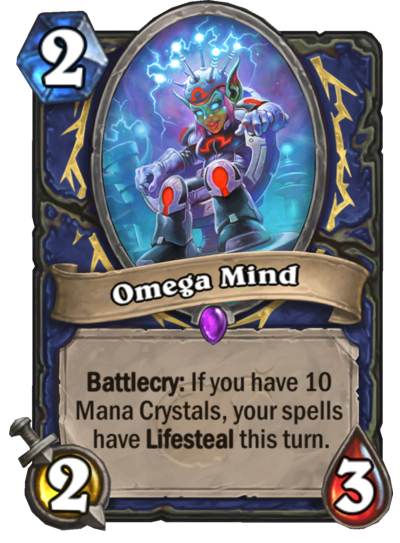 Although Omega Mind might seem like an early-game option due to its low mana cost, you'll only benefit from its Battlecry if you play this card in the late game. There are some strong spells that you could combo with Omega Mind to make them even more powerful. Volcano, for example, deals 15 damage randomly split among all minions, while Lightning Storm deals two to three damage to all enemy minions. If you played these spells after successfully activating Omega Mind's Battlecry, you'll deal a lot of damage and heal yourself for a bunch. The Boomsday Project is the second expansion of the current Standard year, the Year of the Raven. This set will add 135 cards to the game, including new keywords like Magnetic. Hearthstone players can already preorder this expansion—and all of the cards will become available on Aug. 7.